The Uptown District stretches from Broadway Street, incorporating the Garden District, and all the way into Carrolton and to the Mississippi River. It’s a heavily residential area peppered with grand mansions, lush gardens and shopping and dining strips — all canopied by the majestic, centuries-old live oaks. With its photogenic St. Charles Avenue (along which runs a world-famous streetcar), immaculate late-19th century houses and small, unique shops and restaurants it’s safe to say that Uptown is one of the most beautiful and heavily visited parts of New Orleans. Green and storybook-picturesque, Uptown retained a good number of historically significant 19th century mansions built in Italianate, Victorian, and Greek Revival styles, many of which are painstakingly maintained and are in great condition. The area, now known as Uptown New Orleans, was granted to Louisiana Governor Jean Baptiste LeMoyne, Sier de Bienville, in 1719 and divided into smaller plantations in 1723. Uptown was laid out as an urban open system in 1806 by the notable Creole city planner Barthelemy Lafon. The idea was to intersperse and connect a series of parks and residential neighborhoods. It was especially thriving after the World’s Industrial and Cotton Centennial Exposition held in 1884. Parts of Uptown that now contain the stunning Garden District were inhabited by the well-to-do American arrivals after the Louisiana Purchase. Uptown is easy to get to from other parts of the city, and easy to navigate, in part due to the convenience of the St. Charles Avenue streetcar line. On any given day you’ll see visitors hopping on and off the streetcar to take in some sightseeing. Uptown’s architecture is historically unique. It’s easy to fall in love with the area’s oak-lined streets, its lavish gardens that seem to be in bloom all year round, the grand mansions, and the well-preserved shotguns. Most homes aren’t open to the public, but are still worth seeing for their exterior alone. Many houses still bear the names of the families that built them. One could spend the whole day on the historic St. Charles Avenue alone, getting a glimpse at the 19th century New Orleans. The sprawling avenue stretches from Downtown to Uptown, all the way to river, hosting one of the best collections of historic houses in the South. A few most notable ones not to miss, in the descending house number order, are the “Wedding Cake House” (5807 St. Charles Ave.), the 1896 Colonial Revival home with lots of Victorian splendor to offer; the “Anthemion” (4631 St. Charles Ave.), which used to house the Japanese consulate; the “Smith House” (4534 St. Charles Ave.), built in 1906 for the president of the New Orleans Cotton Exchange, William Smith; the “Elms Mansion” (3029 St. Charles Ave.), a 1869 architectural wonder; and the “Diocesan” (2265 St. Charles Ave.), designed and built by the prominent local architect James Gallier. Another St. Charles Avenue gem that deserves a mention is the Milton H. Latter Memorial Library (5120 St. Charles Ave.). This restored neo-Italianate limestone mansion was designed by architects Favrot and Livaudais, and built in 1907 for a wealthy merchant, Mark Isaacs. It was donated to the city by the Latter family in memory of their son, and opened as a library in 1948. Inside, you’ll find the original ceiling frescoes and murals, and the well-preserved formal rooms on the first two floors. The architectural wonders of Uptown also contain a park, a cemetery, and not one but two university campuses. 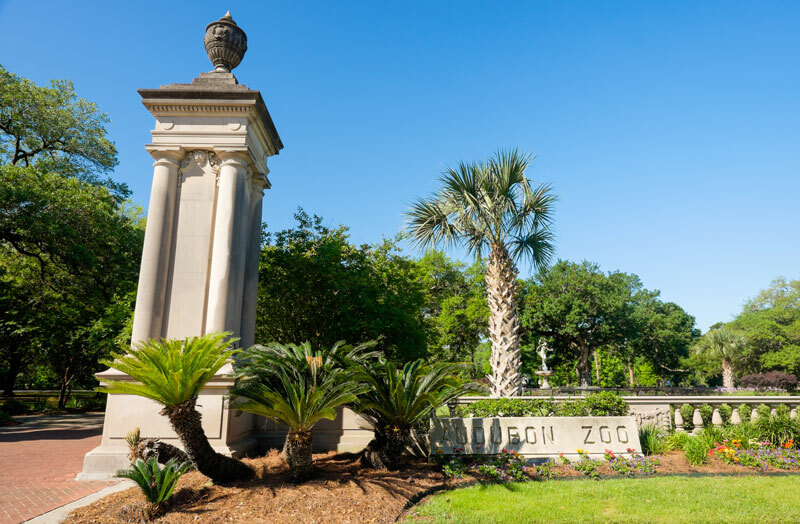 The magnificent Audubon Park and the beautifully appointed Audubon Zoo are only a short streetcar ride away and probably don’t need an introduction. The historic park is a meticulously planned urban oasis and an architectural wonder interspersed with lagoons, picnic shelters, and walking paths. Right across Audubon Park you’ll find the campuses of Tulane and Loyola universities. Tulane started as a Medical College of Louisiana in 1847, in an effort to study and treat the deadly diseases like yellow fever, malaria and smallpox that the city was importing via its port. It morphed into what it is now after Paul Tulane, a wealthy merchant, donated more than $1 million in land, cash and securities in 1884. Placed on the National Register of Historic Places, Tulane University’s campus occupies more than 110 acres and extends north to S. Claiborne Avenue through Freret and Willow streets. From Italian Renaissance to Mid-Century Modern, the campus boasts many styles and is known for its large live oak trees. You can find Loyola’s sprawling main campus adjacent to Tulane and facing St. Charles Avenue and the Audubon Park. It was established in 1904 on the land purchased by the New Orleans Jesuits in 1889. Marquette Hall is the oldest campus building and is the iconic image of the university you’ll probably recognize the most. Finally, no Uptown architectural tour is complete without hitting the above-ground Lafayette Cemetery No. 1 on Washington Avenue, in the heart of the Garden District. It’s the oldest of the seven city-operated cemeteries in New Orleans, with some interesting society tombs (the Independent Order of Odd Fellows, Home For Destitute Orphan Boys among them) and over a thousand family tombs. The iconic cemetery has served as a popular backdrop for many music videos and movies over the years (Double Jeopardy, Dracula, etc. ).